Ogunquit! 5 Minute walk to town and beach! 5 minutes walk to town and beach! 1/23: A room to handle the whole group. Note: The "Total Price" in the instant Quote box includes your REFUNDABLE security deposit of $500, the 9% State of Maine Lodging Tax, and other applicable fees. 5 minutes Walk to town and Beach St. to the Ogunquit Main beach. Located at the end of a private road, this fabulous home can accommodate up to 12 guests! 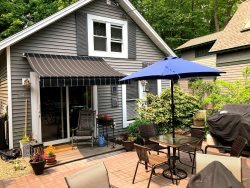 Abutting a wooded lot, the large deck offers a wonderful after the beach, place to gather, and unwind. Enjoy the shade using the fully retractable awning, to walk down to the pergola. Light the gas fire pit in the evening and enjoy stories around the campfire. The home is beautifully decorated, and offers a fully appointed kitchen, dining room, and fabulous great room complete with 72 " Flat screen Tv. Panoramic views of the peaceful setting. Walk out to the deck. Plenty of seating. Linens are supplied, as well as bath towels, kitchen towels, and BEACH towels! Need to bring FIDO? This is a pet friendly home, but please ask first. Each dog is $100 extra and must have a signed PET Addendum from us. There is a fenced in area for your pet to enjoy, however, if you leave the dog behind while out, we ask that you use a crate (per addendum). Three and four day rentals are available in the Spring and Fall. Weekly rental only during the peak season. Dining room - china closet stocked with wine glasses!